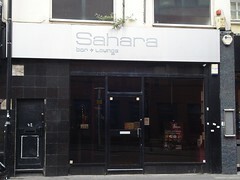 Cocktail bar and shisha garden on South End. Note: As of mid-2016 we haven't seen this open for a while. It may have closed down. Accessibility: A large step to get in. Another step to the toilets. Existence last checked in May 2014. Last edited 2019-01-06 14:28:53 (version 28; diff). List all versions. Page last edited 2019-01-06 14:28:53 (version 28).